With a soft eccho of Alice's Wonderland, Coraline steps through a mystical door and into a surreal world where cats can talk and humans have buttons instead of eyes. Gaiman's creation of the "Other World" is both whimsical and disturbing, and it is dominated by a vague feeling of dark secrets. Coraline is such a quirky and endearing main character and her adventurous bravery never fails. But it was her faithful companion and loyal sidekick, the black cat, that quickly turned into my favorite character. Not only is the black cat perfect for Gaiman's mythical atmosphere, it is also a lovely little creature with its wisdom, sarcasm and solitary independence. "Coraline" is an, almost gothic, horror story for children and it managed to send shivers down my spine with its dark strangeness. It is a delightful, peculiar and disturbingly creepy story, filled with ingenious references to a large number of classic fairy-tales, along with Gaiman's own inventions. If you ever wanted a book with talking cats, faded ghosts, grotesque monsters, a mice orchestra, secret doorways and chocolate-eating dogs; this is for you. 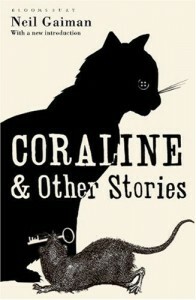 The other stories were lovely as well even though they didn't quite measure up to "Coraline". But I did love "The Price", which is a story about a black cat defending its family. (Yes. I do have a thing for cats). "Troll Bridge" is also a wonderful story, as it is a combination of magic, human greed and simple melancholy.